Gary Locke has warned his Kilmarnock players that they cannot afford to "feel sorry for themselves". Carlton Morris scored a second-half header to give Hamilton a 1-0 win at Rugby Park and move them four points clear of Killie in second bottom. Locke admitted confidence is fragile in his team, but insisted they can escape relegation. "It's difficult," Locke told BBC Scotland. "But the players have to take responsibility on the pitch." The encounter was tense and scrappy, with both sides seemingly stifled by what was at stake. Yet Hamilton emerged with their first victory in 10 games. 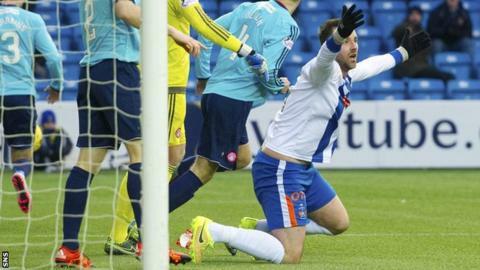 Kris Boyd hit the bar for the home side and claimed for a penalty when he appeared to be bundled over inside the area. Neither side created many chances, though, and Kilmarnock had no response to Morris's header and were booed off at the end by the home fans. "I didn't think there was a lot between the two teams," Locke said. "A set piece wins it for them. "Overall it was a poor game with both sides - especially ourselves early in the game - looking nervous. We saw a lack of confidence from some of the players, but the only way they're going to get through it is by digging in. "It looked [a penalty] from where I was, I didn't see any reason for Kris to go down, he's the type of lad who wants to score a few goals. "It was a bad result, but there wasn't anything in the game. We didn't get outplayed or anything like that, it's just a bit of confidence lacking. "The only way you're going to get that back is by winning football matches. We're well aware that we need to start doing that." Hamilton player-manager Martin Canning was satisfied with the result. Since losing 8-1 at Celtic Park his side has drawn 0-0 with Hearts and now beaten Kilmarnock. Quality and composure were lacking from both sides, but the Hamilton manager believes that at this stage of the season it is points that are more important than displays. "The performance is always important but today the result was the most important thing," he said. "It was a big result for us to come down here and win, it's never an easy place to come given what was at stake. "I was pleased with the effort the boys put in. We were solid and on another day we could have won by another couple of goals. "Every game now in its own right is a massive game. You've got to put everything you've got into it and the boys did that today." Canning also said he is hopeful of adding to his squad after releasing striker Christian Nade. "We're looking to try to do a couple of things if we can [before the transfer window shuts]," he said. "It's not about adding numbers. The quality's there and if we can add to that we're looking to do so."